It’s Sunday night and I am watching one of my favorite shows, which of course revolves around food. In this particular episode, competitors were challenged to incorporate blue into their baked delights without using artificial coloring. 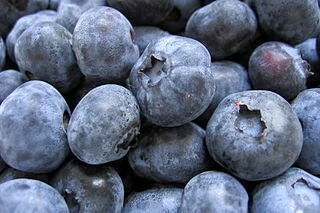 That may not seem to be much of a challenge, but there are actually very few naturally occurring blue foods. Many challengers reached for blueberries as their blue ingredient, but blueberries seem to be closer to purple than blue to me. (I guess because blue is in the name, we can just consider it close enough to blue to pass. 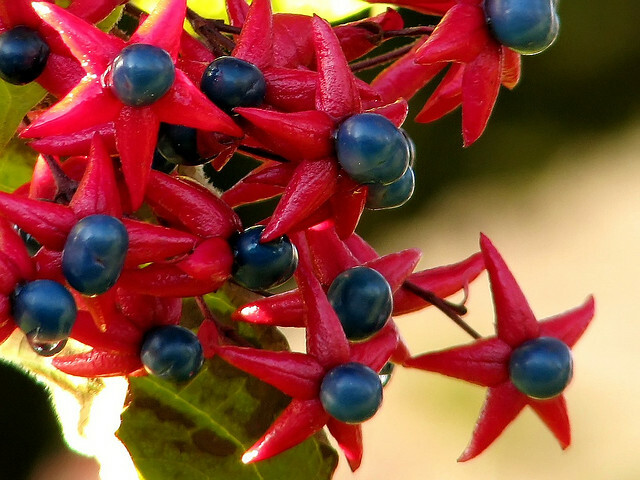 But how many other blue fruits or vegetables can you think of?) Fruit and vegetable colors seem to be dominated by greens, yellows, oranges and reds. With my interest piqued, I set out to explore and better understand how the fruits (and vegetables) got their colors. Figure 2. 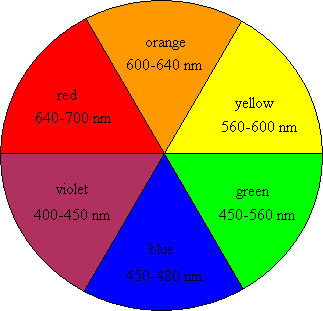 Color wheel (with corresponding light wavelengths). Image modified from Benja. So how does this light absorption work? Different wavelengths of light correspond to different energy levels, with reds at the low (long wavelength) end and blues at the high (short wavelength) end of the visible spectrum. When light is absorbed by a surface, the energy can be used to promote electrons on the molecules of that surface from their ground state to an excited state. The closer the ground and excited states are to each other, the lower the energy (i.e. longer wavelength) of light that is absorbed. When a certain wavelength of light hits a surface and that same wavelength bounces off, it’s called reflection. There is also transmission, where light passes through an object unchanged and unabsorbed. Absorption, reflection, and transmission can happen at the same time; however, the light that is absorbed by the system cannot be seen. Thus, we only see what light is reflected or transmitted and not the light that is absorbed by the surface. 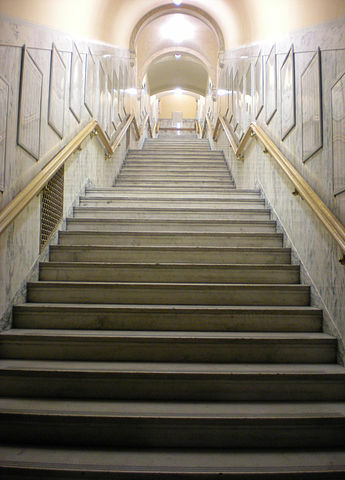 If that stuff about ground states and excited states seems a little confusing, here’s an analogy: imagine the transition between the ground state and the excited state is like going up the staircase in a tall building. Every floor in the building is equivalent to a state and energy is required to walk from the ground floor up to the higher floors. If you are visiting a friend in the building who lives on the top floor you will have to use a lot of energy to make the trip. Some molecules have excited states near the top of the “building” and others live much closer to the ground. If it takes a lot of energy to get to the excited state, that means high energy light (i.e. blues and purples) has to get absorbed to excite the electrons of that surface, and the remaining wavelengths reflected back to our eyes will be the lower energy ones (i.e. reds and oranges). Now that we have covered very generally why we see specific colors, we can begin to discuss how this relates to the colors that we see in different foods. You might be familiar with lycopene (see Figure 4 for its structure) and beta-carotene from seeing them sold in grocery and health stores as dietary supplements, or maybe you even read about the great benefits of lycopene on the back of your favorite ketchup bottle. Lycopene and β-carotene belong to a class of molecules called carotenes. Carotenes are responsible for the red, orange, and yellow appearance of some foods. Lycopene is abundant in some red foods like tomatoes, and β-carotene is abundant in some orange foods like carrots. Figure 4. (Left) Structure of lycopene, a carotene that is abundant in foods like tomatoes. Foods high in lycopenes are generally red in color. The blue highlighted portion in the middle of the lycopene structure illustrates conjugated double bonds. (Right) Ketchup gets its lycopene from tomatoes. Anthocyanins (Figure 5) are also responsible for the red colors in some foods, and in addition they contribute to the colors blue and purple in other foods,1 one of which is blueberries. Figure 5: General structure of anthocyanin. This molecule is responsible for the colors red, blue, and even some purples. The oxygen atom, shown in red, is a heteroatom in this system and the blue ring structure is an illustration of a cyclical aromatic system. What do all of these molecules have in common? It might not be readily apparent, but they all have double bonds between some of their carbon (and oxygen in the case of anthocyanin) atoms. 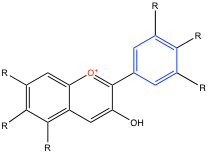 More importantly, they all have either conjugated double bonds or alternating double and single bonds (highlighted in the blue regions of the Figures 4 and 5). These types of bonds reduce the amount of energy required for electrons to move between states. Returning to our staircase analogy: if your friend suddenly moves from the 10th floor to the 3rd floor, it would take less energy to visit them. Remember, in order for a food to appear blue, it needs to absorb in the red or orange wavelengths. It turns out that in order for a molecule to absorb light in this region, the types of carbon bonds found in carotenes don’t work. Anthocyanins, on the other hand, have both the oxygen atoms and the conjugated bonds that make this absorption possible – the addition of oxygen and conjugated bonds lowers the energy required to transition between states, making it possible for red and orange wavelengths to be absorbed. This might be the key to why there are relatively few naturally occurring blue pigments: the anthocyanin compounds that meet the requirements to make this transition possible are much less common in nature than the carotenes that cause red and orange pigments. Decisions about the use of additives to color food relate to the work that we do in the Center for Sustainable Nanotechnology, because as nanotechnology becomes more commonplace and the field of nanoscience grows, there is the potential for biological and environmental exposure. Given the uncertainty with regards to the toxicity of some manufactured nanomaterials, should we hold out on incorporating them into our daily routine until we have assessed their toxicity? This is some of the work we do within the Center: we try to assess the potential toxicity of nanomaterials from a fundamental perspective in order to effectively design particles that are functional and safe. To address this issue with food coloring, the Food & Drug Administration placed food additives on a provisional list until their safety could be evaluated.3 Should the same be done for nanomaterials? In March of this year, the Environmental Protection Agency (EPA) announced that it will be “pursuing a comprehensive regulatory approach” in order to gather information on all existing and newly developed nanomaterials in order “to ensure that chemicals that may or will pose an unreasonable risk to human health or the environment are effectively controlled.”4 By taking a more preemptive approach to exploring potential toxicity here in the Center, we will hopefully help the EPA towards this goal. Barrows, J.N. ; Lipman, A.L. ; Bailey C.J. Color Additives: FDA’s Regulatory Process and Historical Perspectives. Food Safety Magazine, 2003, via FDA.gov. EPA, Control of Nanoscale Materials under the Toxic Substances Control Act, 2015.